Do Mangoes Intensify the Effects of Cannabis? There are many ways to improve a marijuana high – switching strains, taking a tolerance break, or getting high in a new environment, for example – but one of the easiest ways to get higher off your stash starts with a quick run to your local super market for some mangoes. 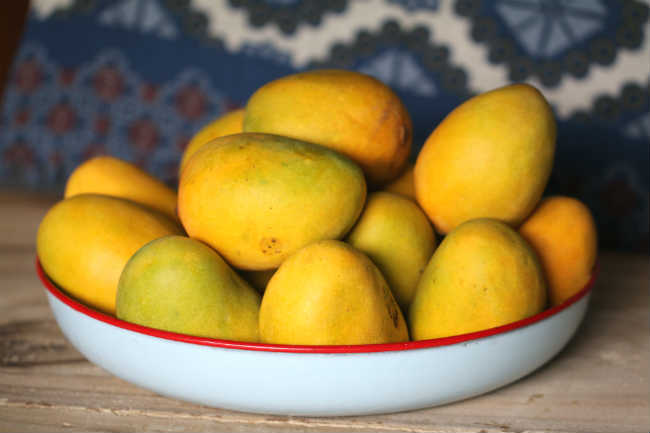 Thanks to their abundance of myrcene terpenes, mangoes have been shown to not only increase the level of “high” one experiences, but to reduce onset time by about half, as well. So how does it work? And are there tricks to improving the efficiency of the mango/marijuana combo? We’re glad you asked. According to a 1997 Swiss study analyzing the terpene profile of 16 different cannabis strains, myrcene was the most prominent terpene in each. Mango also contains high levels of myrcene terpenes which work on the same receptors as cannabis causing an entourage effect. You see, whereas THC will get you “high,” it is the myrcene that’s responsible for the relaxed, pain-free qualities. Though there is minimal research on the subject, the consistency of anecdotal claims prove the correlation. However, we can only theorize at this point as to why that is. It is currently believed that when you eat mango, myrcene terpenes make their way into your bloodstream and ultimately your brain. If these terpenes are already present in your system when you smoke or otherwise consume cannabis, THC and other cannabinoids will hitch a ride on the back of these terpenes thus speeding onset time. Myrcene has a distinct flavor of earth and fruit which lends itself nicely to flavorful strains but can also be a tasty pre-smoke treat, too. Eating mango 1-2 hours before a smoke sesh will give the fruit time to digest and will lessen the cravings for junk food later in your high. Consuming in New Places: Can a Change of Scenery Get You Higher? If you’re planning on eating mango specifically for the boosted high, it’s important to note your metabolic rate. Those with a slow metabolism will have better luck consuming mango up to two hours prior to smoking while those with a fast metabolism may do better eating two or three mangoes less than an hour before. No matter when you eat them, consuming mangoes only a few minutes before or after consuming cannabis should also increase your high. Basically, as long as the myrcene terpenes are floating around in your system at the same time those precious cannabinoids are, you should be good to go. Mangoes are good for so much more than just getting high. In addition to their awesome flavor, mangoes help improve digestion (which helps if you prefer edibles), increase bone density, improve skin and hair conditions, reduce asthma flare-ups (which can be triggered by a harsh smoke), and help stabilize blood/sugar levels in diabetic patients. Moreover, mangoes may help protect against multiple forms of cancer. In a study conducted by Texas A&M, food scientists found that mango extracts have a positive impact on all forms of cancer tested (colon, breast, lung, prostate, and leukemia) with the greatest impact on breast and colon cancers. Cannabis and tasty foods go hand-in-hand, but some foods can actually improve your high, too! Whether you’re looking to stretch your bag-o-weed or just get really, really baked off of it, you’ll have better luck if you add a little mango fruit into your smoke sesh routine. Do you have any mango recipes or tips for consuming mango before getting high? Share them below!